Internal ribosome entry site (IRES) elements fold into highly organized conserved secondary and probably tertiary structures that guide the ribosome to an internal site of the RNA at the IRES 3′end. The composition of the cellular proteome is under the control of multiple processes, one of the most important being translation initiation. In each poliovirus Sabin vaccine strain, a single point mutation in the IRES secondary-structure domain V is a major determinant of neurovirulence and translation attenuation. Here we are extrapolating poliovirus findings to a genomic related virus named coxsackievirus B3 CVB3); a causative agent of viral myocarditis. We have previously reported that Sabin3-like mutation (U473 → C) introduced in the domain V sequence of the CVB3 IRES led to a defective mutant with a serious reduction in translation efficiency and ribosomal initiation complex assembly, besides an impaired RNA-protein binding pattern. With the aim to identify proteins interacting with both CVB3 wild-type and Sabin3-like domain V RNAs and to assess the effect of the Sabin3-like mutation on these potential interactions, we have used a proteomic approach. This procedure allowed the identification of three RNA-binding proteins interacting with the domain V: eIF4G (p220), eIF3b (p116) and eIF4B (p80). Moreover, we report that this single-nucleotide exchange impairs the interaction pattern and the binding affinity of these standard translation initiation factors within the IRES domain V of the mutant strain. Taken together, these data indicate how this decisive Sabin3-like mutation mediates viral translation attenuation; playing a key role in the understanding of the cardiovirulence attenuation within this construct. Hence, these data provide further evidence for the crucial role of RNA structure for the IRES activity, and reinforce the idea of a distribution of function between the different IRES structural domains. The virtual slide(s) for this article can be found here: http://www.diagnosticpathology.diagnomx.eu/vs/6160165131045880. Internal Ribosome Entry Site (IRES) elements are specialized RNA regulatory sequences governing cap-independent translation initiation in eukaryotic mRNAs that are translated during cellular stress, that is, when cap-dependent translation is compromised[1–4]. IRES elements, initially reported in the genomic RNA of two picornaviruses (namely, poliovirus (PV) and encephalomyocarditis virus (EMCV)), drive internal initiation of translation in the mRNA of all members of the Picornaviridae family[5–8]. Soon after their discovery, IRES elements were also found in other RNA viruses infecting mammals, such as hepatitis C (HCV), pestiviruses[9, 10], or retroviruses[11–13], as well as in RNA viruses infecting invertebrates[14, 15], plants, and protozoa. Recently, IRES-dependent translation in mRNAs transcribed from DNA viruses belonging to the Herpesviridae family has been reported. Initiation of translation in eukaryotes, which is the rate-limiting step in protein synthesis, involves a set of specialized proteins that recruit the small ribosome subunit to the m7GpppN structure (termed cap) located at the 5′-end of most mRNAs[19, 20]. The cap-dependent initiation complex is thought to scan the 5′ untranslated regions (UTR) until an AUG codon is placed in the appropriate context to start protein synthesis[20–22]. In marked contrast with this mechanism, a few viral RNA initiate translation internally via the IRES using a cap-independent mechanism, bypassing proteins bound to the 5′ UTR as well as strong RNA structures in front of the start site. Because IRESs differ in nucleotide sequence, RNA secondary structure and trans-acting factors requirement[23–25], deciphering the role of evolutionary conserved motifs is critical to understand internal initiation mechanisms. Functional and structural analysis of viral IRESs has shown that RNA structure plays a fundamental role for IRES-dependent translation initiation[26–28]. Consistent with this, compensatory substitutions tend to conserve RNA structure during RNA virus evolution[1, 29]. Besides the structural organization, the IRES function relies on the interaction with cellular proteins. Indeed, RNA-binding proteins play a crucial role in gene expression control in all organisms. In eukaryotic cells, a large variety of ribonucleoprotein complexes affect the processing, transport, localization, translation and decay of mRNAs[30, 31]. Thus, RNA-binding proteins are responsible for the establishment and regulation of RNA–protein networks that determine the target mRNA fate. The untranslated regions of mRNAs play a key role in many of these processes, serving as platforms for the assembly of macromolecular complexes particularly those controlling translation initiation. Myocarditis or inflammatory cardiomyopathy is inflammation of heart muscle which can be caused by several agents. Myocardial fibrosis occurs in a number of pathological processes, most commonly hypertension. Other disease states capable of producing cardiac fibrosis include hypereosinophilia, scleroderma, viral myocarditis and inherited genetic mutations. In the same context, Lakhan and Harle reported the case of an elderly, non hypertensive athlete who died suddenly of sepsis. Autopsy demonstrated foci of fibrosis throughout the right and left ventricle and significant narrowing of the left ventricular cavity. The detection of viral genomes in endomyocardial biopsies by molecular techniques has greatly expanded the list of viruses implicated in myocarditis. Initially, the molecular diagnosis of the viral etiology of myocarditis focused on the enteroviruses. More recently, Tavora and collaborators reported a 41-year old African American immunocompetent patient who died of parvoviral myocarditis. Coxsackievirus B3 (CVB3) is a picornavirus that can also cause viral myocarditis in humans. It has a single-stranded plus sense RNA. The 7.4 kb long genomic RNA is naturally uncapped and contains a viral encoded oligopeptide (VPg), covalently linked at the 5′ end. The highly structured 5′UTR is 741 nt long and has been shown to contain a type I IRES element which helps in mediating internal initiation of translation of CVB3 RNA[34, 35]. Type I IRESs occur in PV, CVB3, enterovirus 71 (EV71), and other members of the Enterovirus genus of Picornaviridae[6, 36]. They are 450 nt long and have 4 major domains (II, IV, V, and VI) but share little homology with type II IRESs except for a Yn-Xm-AUG motif at their 3′ border, in which the AUG triplet is naturally silent[22, 36]. Instead, depending on the virus, initiation occurs 30–150 nt downstream of this motif. The mechanism of initiation on type I IRESs has not been solved, and little is known about its requirements for canonical factors or their roles in this process. Internal initiation of translation in CVB3 has been shown to be influenced by various cis-acting elements present in the 5′UTR. The core element of the IRES in CVB3 RNA has been putatively mapped between nt 432–639 of the 5′UTR. This region was shown to possess several critical cis-acting elements which includes a pyrimidine-rich tract and an AUG triplet (AUG591) about 25 nucleotides downstream of the pyrimidine-rich tract. It was reported that the MFOLD structure of CVB3 IRES and its secondary structure showed a high degree of similarity to that of poliovirus 5′ UTR and that attenuating mutations for the Sabin vaccine strains of poliovirus are located in domain V; consequently, this domain has received a great deal of experimental interest. Importantly, we have previously addressed the question of whether the attenuating mutations of domain V of the PV IRES were specific for a given genomic context or whether they could be transposed and extrapolated to a genomic related virus, i.e. CVB3. In this context, Ben M’hadheb-Gharbi and collaborators[41, 42] have reported that the Sabin3-like mutation (U473 → C), obtained by direct mutagenesis of the CVB3 genome, and precisely in the domain V sequence of the CVB3 IRES led to a defective mutant with a serious reduction in translation efficiency compared to the wild-type strain. Prediction of the secondary structure by MFOLD program indicated a structural perturbation of the stem containing the Sabin3-like mutation, suggesting that specific protein-viral RNA interactions were disrupted, preventing efficient viral translation. The poor translation efficiency of the Sabin3-like IRES was then explicated by its inability to correctly bind some essential non-canonical translation factors during the initiation of translation. To fill this gap, we have used a proteomic approach that has allowed the identification of some RNA-binding proteins interacting with both wild-type and mutant CVB3 IRESes. Interestingly, the mutant RNA showed a reduced RNA-protein binding profile and a reduced efficiency of ribosomal complex assembly compared to the wild-type IRES. Taken together, these data were explicated by the inability of the mutant RNA to interact with some trans-acting factors critical for enhanced IRES function. Consequently, we hypothesized that the Sabin3-like mutation induces a partial destabilization of the RNA secondary structure of the domain V, leading to a reduced recognition of this region by protein factors necessary for CVB3 translation initiation. Thus, in order to confirm this hypothesis and with the aim of identifying translation initiation factors specifically binding to domain V of the wild-type and Sabin3-like CVB3 RNAs, a proteomic approach was carried out. Over the years, RNA-protein interactions have been determined using different approaches, such as Electrophoretic mobility-shift assays, UV cross-linking or Filter-binding assays. Along this idea, riboproteomic approaches have facilitated the identification of various proteins interacting with different IRES elements. Accordingly, in the present study, we performed UV-crosslinking assays to compare the RNA-protein interaction pattern between CVB3 wild-type and mutant domain V RNAs in the presence of HeLa and BHK21 cell extract proteins. Filter-binding experiments were then carried out in order to assess the binding affinity of some initiation factors: eIF3, eIF4G and eIF4B to both wild-type and Sabin3-like domain V RNAs. Interestingly, the mutant RNA showed a reduced protein-binding profile compared to the wild-type domain V. A number of proteins binding to the domain V were identified: p220 (eIF4G), p116 (eIF3) and p80 (eIF4B). Filter-binding assays showed a better binding affinity of eIF3, eIF4G and eIF4B to the wild-type CVB3 domain V. These results perfectly correlate with the impaired protein-binding and the reduced translation efficiency previously reported with the Sabin3-like construct[41–44]. The Coxsackievirus B3 (CVB3) Nancy prototype strain and the Sabin3-like mutant of CVB3, used as a “vaccine candidate” and obtained by direct mutagenesis (U473 → C) were used for all the experiments. These strains were propaged in Vero cells (African Green Monkey Kidney Cells) (Bio Whittaker) maintained in Eagle’s minimal essential medium supplemented with 10% heat-inactivated fetal calf serum (FCS) (Sigma), 1% L-glutamine, 50 μg/ml de streptomycin, 50 UI/ml de penicillin (Bio Whittaker), 1% non-essential amino acids (Gibco BRL) and 0.05% Fongizone (Amphotericin B, Apothecon). Based on the sequence of the CVB3 domain V, primers DV(Wt)-F (5”- TAT gAA TTC TAA TAC gAC TCA CTA TAg gTC CTC Cgg CCC CTg AAT gCg gCT AAT CCT AAC TgC ggA gCA CAC ACC CTC AAg CCA gAg ggC AgT gTg TCg TAA -3”)/DV(S3)-F (5′- TAT gAA TTC TAA TAC gAC TCA CTA TAg gTC CTC Cgg CCC CTg AAT gCg gCT AAT TCT AAC TgC ggA gCA CAC ACC CTC AAg CCA gAg ggC AgT gTg TCg TAA -3′) and DV-R (5′- TAT ggA TCC ATg AAA CAC ggA CAC CCA AAg TAg TCg gTT CCg CTg CAg AgT TgC CCg TTA CgA CAC ACT gCC CTC Tgg CTT gAg ggT gT -3′) were designed for the synthesis of domain V for both CVB3 wild-type (Wt) and Sabin3-like (S3) strains by primers- hybridization and extension method. EcoRI restriction site/T7 promoter upstream and BamHI restriction site downstream were introduced into primer’s sequences. Primers- hybridization and extension technique was used as previously described to synthesize the CVB3 domain V (158 nucleotides). This technique consists briefly in reacting a pair of primers amplifying the gene of interest and designed so that an overlapping sequence of about 20 nucleotides between forward and reverse primers is incorporated. The reaction mixture was prepared as follows: Taq Buffer (1X) (Roche), 0.05 mM dNTPs, 100 pmol from each primer DV(Wt)-F/DV-R or DV(S3)-F/DV-R, 1 U Taq polymerase (Roche) and the final volume (50 μL) was adjusted by adding sterile distilled water. The reaction was then incubated in a thermocycler (BioRad) according to the following thermal profile: 4 min at 72°C, 6 min at 44°C and 60 min at 70°C. Amplification products were revealed by electrophoretic migration on 2% agarose gel containing Ethidium Bromide. Amplified CVB3 wild-type and mutant domains V were digested with EcoRI and BamHI (Roche Applied Science). Digestion products were, then, purified using the “QIA quick PCR Purification Kit” (Qiagen) and inserted into the pUC19 plasmid (Invitrogen) digested with the appropriate enzymes and purified using the “Wizard SV Gel and PCR Clean-Up system kit” (Promega). Ligation products were, then, transformed in chemocompetent Escherichia coli DH5α cells. Transformants were selected in Luria–Bertani (LB) agar supplemented with 100 μg/ml Ampicillin, 64 μg/ml 5-bromo-4-chloro-3-indolyl-beta-D galactopyranoside, and 0.2 mM isopropyl beta-D-thiogalactopyranoside. Blue–white selection was used to identify white clones containing inserts, while blue clones contained undigested cloning vector. White colonies were individually cultured in LB broth. In order to analyze the cloned sequences, randomly chosen clones were tested by PCR-colony as previously described. Positive clones were, then, sequenced using an ABI Prism BigDye Terminators Sequencing Kit (Applied Biosystems). Vector primers M13-F (5′-TgT AAA ACg ACg gCC AgT -3′) and M13-R (5′- CAg gAA ACA gCT ATg ACC -3′) (New England Biolabs) were used for sequencing. Plasmids were linearized to obtain transcripts corresponding to wild-type and mutant CVB3 domains V. Following digestion, DNAs were phenol extracted and ethanol precipitated. Transcription was performed for 1 h at 37°C using 50 U of T7 RNA polymerase (New England Biolabs) in the presence of 0.5–1 μg of linearized DNA template, 50 mM DTT, 0.5 mM each rNTP, and 20 U of RNasin (Promega). Transcripts were uniformly labeled to a specific activity of 0.5–1 × 106 cpm/pmol using (α32P)-CTP (400 Ci/mmol). Reactions were incubated for 10 min at 37°C with 1 U of RQ1 DNase (Promega), and unincorporated (α32P)-CTP was eliminated by exclusion chromatography in TE-equilibrated columns (Microspin G25 columns, Biosciences). RNA was extracted with phenol–chloroform, ethanol precipitated, and resuspended in RNase-free water (1–2 × 105 cpm/μL). Prior to further use, the integrity of probes was verified in 6% acrylamide, 7 M urea denaturing gel. Dried gels were exposed for autoradiography. For a comparative analysis of the binding affinity of cellular proteins to domain V of the CVB3 IRES, two cell lines were used: HeLa (Human) and BHK-21 (Hamster) cells, respectively known as prominent and lacking expression of the coxsackie-adenovirus receptor (CAR). These cell lines had been chosen since they represent well established systems for studying viral replication and infectivity. In addition, cells lysates contain host proteins that support internal translation initiation of the viral RNA. BHK-21 and HeLa cells, grown to 100% confluence in 10 cm dishes in 5% FCS-supplemented DMEM, were washed twice with cold PBS, scraped and collected by centrifugation. The cellular pellet was resuspended in 1–2 volumes of 10 mM HEPES (pH 7.4), 10 mM KAc, 1.5 mM MgAc, and 2.5 mM DTT, and homogenized by 30 strokes in a glass Dounce. Cellular debris was eliminated by centrifugation at 5,000 × g for 5 min. The clear lysate was centrifuged at 10,000 × g for 5 min, adjusting the supernatant to 3% glycerol. The concentration of protein in the sample was determined by the Bradford assay (Bio-Rad). Total cytoplasmic RNA was isolated from BHK-21 and HeLa cell monolayers, washed twice with cold PBS and lysed in 1 mL of 50 mM Tris–HCl (pH 7.8), 120 mM NaCl, and 0.5% NP40. Following elimination of cellular debris, cytoplasmic RNA was extracted from 200 μl cytosolic extract using TriPure Isolation Reagent (Boehringer Mannheim) as previously described. Following ethanol precipitation, the RNA sample was resuspended in TE (10 mM Tris–HCl pH 8, 1 mM EDTA) and the concentration was estimated from the OD measured at 260 nm. Extracts from HeLa and BHK-21 cells (40 μg of proteins) were incubated with uniformly radiolabeled probes (0.2 pmol, 1–2 9x 105 cpm) in 15 μL of 10 mM HEPES–KOH, pH 7.9, 35 mM KCl, 2 mM MgCl2, 10% glycerol, 0.05% NP40, 0.5 mM DTT, 1 μg/μL yeast tRNA (as non-specific competitor). After 15 min of incubation at room temperature, RNA–protein mixtures were exposed to UV light (254 nm, Stratalinker 1800, Stratagene) for 30 min on ice, at 10 cm from the lamp. The non-protected probe in UV-irradiated extracts was digested with RNase A (0.3 μg/μL) during 30 min at 37°C. In parallel, competitive UV-cross-linking assays were performed. Specific competitors (self RNA competitors) were added, five min before adding radioactive probes, at specified molar excess ratios. Yeast tRNA was also used as a non-specific competitor as described above. The RNA-crosslinked proteins were resolved in 10% SDS–polyacrylamide gel, following addition of the loading buffer, and heating at 90°C for 2 min. When required, an aliquot of crosslinked extracts was treated with proteinase K, in the presence of 0.5% SDS, 30 min at 50°C, followed by 30 min at 37°C. After electrophoresis, gels were dried and the 32P-labeled complexes were visualized by autoradiography. Molecular weights of domain V-protein complexes were determined by comparing against a simultaneously loaded protein marker. One of the oldest and simplest methods for detecting RNA–protein interactions is the filter-binding assay. If a mixture of RNA and protein is passed through a nitrocellulose filter, the protein is retained and the RNA will pass through. But if the protein is capable of binding RNA, then RNA will be retained on the filter as well. This protocol requires a purified protein of interest and labeled RNA. To perform the assay, the protein sample is serially diluted to several concentrations. It is then mixed with a fixed amount of labeled RNA and allowed to bind under desired conditions for 30–60 min. The binding reactions are then applied to a 96-well dot-blot apparatus with low vacuum to trap the complexes on three membranes: The top membrane traps aggregates, the middle membrane (nitrocellulose) binds proteins and RNA–protein complexes, and the bottom membrane (which is charged) collects free RNA. After washing and drying, the membranes are exposed for quantification. Accordingly, in the present study, in order to assess the affinity and the specificity of interaction of CVB3 wild-type and Sabin3-like domain V RNAs within the initiation factors eIF3, eIF4G and eIF4B, filter-binding assays were carried out. Initiation factors (eIF3, eIF4G and eIF4B) were prepared following previously established procedures[13, 48]. Labeled RNAs encoding domain V were annealed by heating to 80°C for 2 min in water then cooled at room temperature for 7 min. RNA (10 nM) was then added to a tube containing a folding/binding buffer (20 mM Tris–HCl, 100 mM potassium acetate, 200 mM KCl, 2.5 mM MgCl2, 1 mM DTT), and incubated 5 min at room temperature. Initiation factors eIF3, eIF4G and eIF4B were serially diluted immediately before use and then added to reactions. These were incubated at 4°C for 15–30 min before application to the filter. Measurements were performed in parallel within wild-type and mutant domain V RNAs. Filter-binding assays were performed in triplicate using two filters. From top to bottom: a nitrocellulose filter and a charged nylon filter. The filters were pre-soaked in the binding buffer (1X), assembled in a dot blot apparatus or on glass filter funnel and the reactions were applied and directly vacuum filtered. Filters were then rinsed, removed, dried, and radioactivity was quantified using a storm phosphorImager (GE healthcare). The percentage of protein-RNA bound was then calculated and graphs: % binding RNA – protein = f (protein concentration) were drawn. 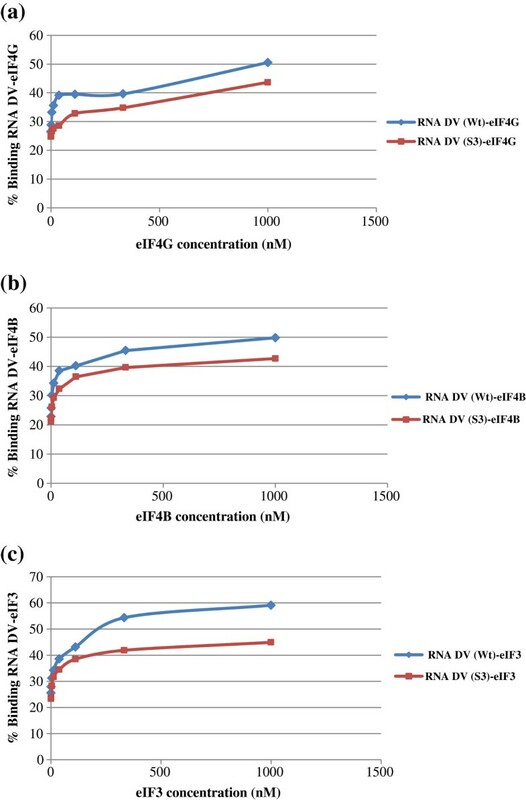 To assess the binding affinity of CVB3 wild-type and mutant domain V RNAs to eIF3, eIF4G and eIF4B, binding assays were performed and the percentage of protein-RNA bound was calculated. ANOVA test using STATVIEW statistical software package was performed. Normality and homogeneity of data were confirmed before the test and values were considered statistically significant at p < 0.05. Two CVB3 strains were analyzed: a wild-type and an attenuated Sabin3-like strains. The attenuation of the Sabin3-like strain was mainly conferred by a single point mutation in the IRES domain V sequence. Both wild-type and Sabin3-like domains V were amplified using the primers- hybridization and extension technique as described in the “Materials and Methods” section. 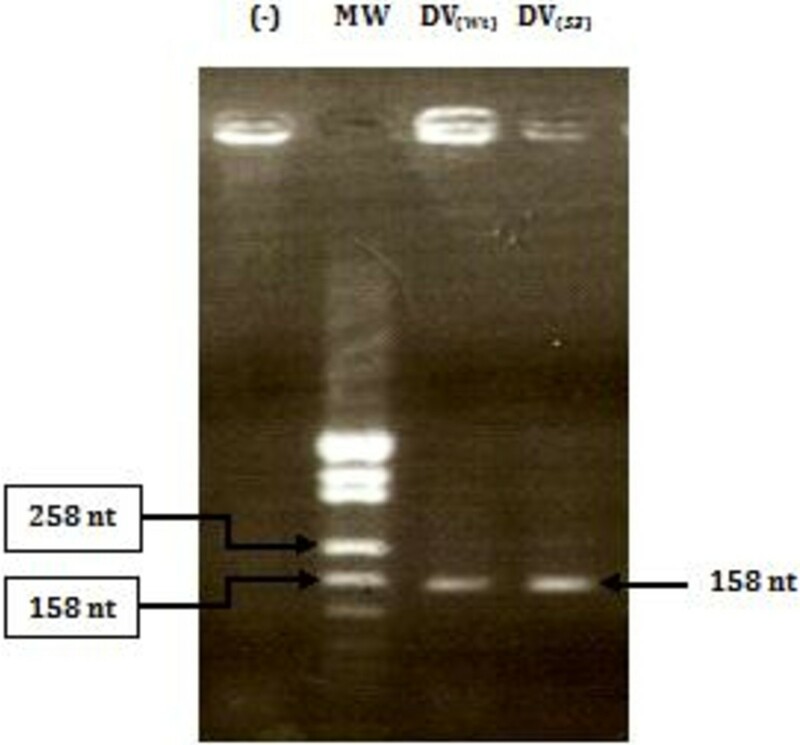 Amplified wild-type and mutant domains V were analyzed on 2% agarose gel (Figure 1). Amplified domain V DNAs (158 nt) were cloned in a pUC19 vector between EcoRI and BamHI restriction sites. Transformed pUC19/IRES clones were confirmed by PCR-colony and sequencing. 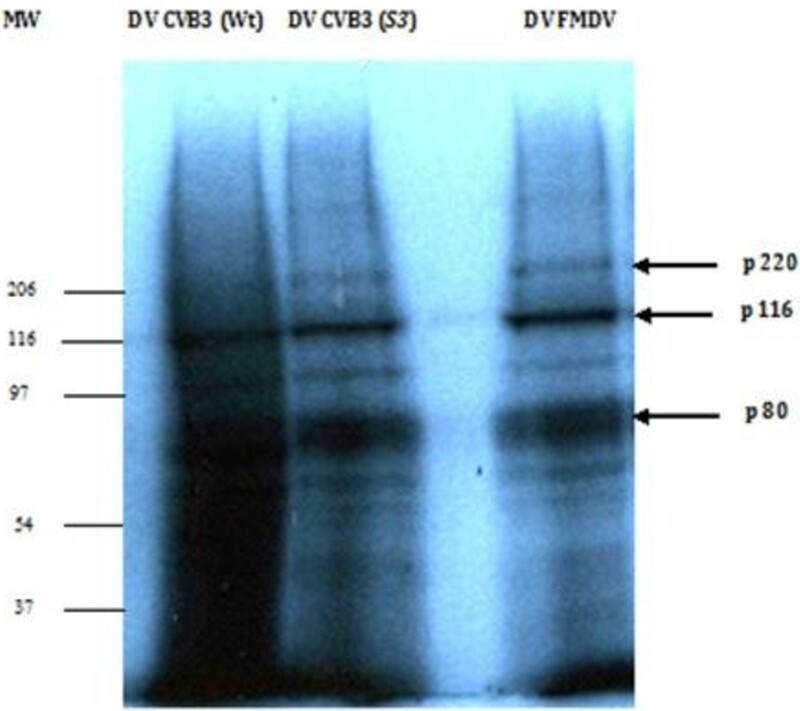 Electrophoretic profile, observed on 2% agarose gel, of CVB3 wild-type and Sabin3-like domain V DNAs. Lane MW: molecular weight DNA marker; lane (−): a negative control for the reaction; lane DV(Wt): domain V wild-type DNA; lane DV (S3) : domain V Sabin3-like DNA. Experimental conditions were carried out as described in the “Materials and Methods” section. RNAs encoding CVB3 wild-type and Sabin3-like domains V were transcribed using the T7 RNA polymerase as described in the “Materials and Methods” section. After transcription, the integrity of these RNAs was verified on an Acryl-Bisacrylamide 6%–7 M Urea gel. Radiolabeled RNAs were then quantified using Biospec-NanoDrop technology. According to our previously published data[43, 44], we suspected that the Sabin3-like mutation would impair the binding of cellular protein factors to the viral RNA that mediate the association of the ribosomal 40S subunit within the CVB3 IRES, and particularly, to the domain V. Four polypeptides of 220, 116, 80 and 57 kDa suspected as eIF4G, eIF3b, eIF4B and PTB, respectively bound to the CVB3 IRES RNA in the presence of BHK-21 cell extract and a reduction in the RNA-protein binding profile for the mutant RNA compared to the wild-type IRES were reported. Interestingly, with the aim of mapping the binding structural sites of initiation factors involved in the CVB3 IRES-dependent translation, we have performed a proteomic approach to identify host factors interacting with domain V of the CVB3 IRES, in parallel to domain V of FMDV as this structure has been previously shown to interact with several identified initiation factors[21, 49, 50]. To this end, CVB3 wild-type and mutant domain V and FMDV domain V transcripts were incubated with protein extracts prepared from HeLa and BHK-21 cells. A control RNA with unrelated sequence was used to determine the presence of non specific RNA-binding factors, and hence, discard non specific factors from the subsequent analysis. Additionally, to reduce non-specific binding, a large excess of tRNA was added to the incubation mixture. Only proteins that become covalently linked to the RNA upon UV irradiation are revealed by gel autoradiography. The autoradiogram patterns (Figures 2 and3) showed a reduced interaction of the Sabin3-like RNA with several cellular polypeptides compared to the CVB3 wild-type domain V.
Autoradiogram of an UV-crosslink assay performed with IRES domain V labeled probes and an extract prepared from HeLa cells. Proteins were resolved in a 10% SDS-PAGE. Domain V of FMDV IRES was used as positive control (lane DV FMDV). Lanes DV CVB3 (Wt) and DV CVB3 (S3) demonstrate the RNA–protein interaction pattern of CVB3 wild-type and Sabin3-like IRES domains V. Equal amounts of total proteins (10 μg) were loaded per well. The molecular weight (MW) of each complex was determined by comparing to a concurrently loaded MW marker: Prestained SDS-page standards broad range (Biorad). UV-cross-linking to determine the molecular weight of RNA binding proteins to domain V of the CVB3 IRES. (α32P)-CTP-labeled probes were added to BHK-21 cell total protein extracts and cross-linked by UV-light exposure, followed by RNase A treatment. Proteins that cross-linked to radioactive RNAs were detected by 10% SDS-PAGE and subsequent autoradiography. Lanes DV CVB3 (Wt) and DV CVB3 (S3) demonstrate protein-probe interactions within CVB3 wild-type and Sabin3-like domain V RNAs, respectively. Lane DV FMDV indicates RNA-protein complexes formed within the FMDV domain V. Equal amounts of total proteins (10 μg) were loaded per well. The molecular weight of each complex was determined by comparing to a concurrently loaded molecular weight (MW) marker: Prestained SDS-page standards broad range (Biorad). In fact, a reduction in the band intensity of Sabin3-like domain V-protein complexes was observed; and thus by comparing the intensities of protein-Sabin3-like RNA complexes in each gel, we can deduce a relative reduced affinity of the mutant domain V toward cellular proteins present in HeLa and BHK-21 cell extracts. Thus, we can suggest that the Sabin3-like mutation leads to a lower efficiency of interaction of the domain V within translation initiation factors present in both cell extracts. As mentioned above, competitive UV-cross-linking assays were performed, in parallel, using a specific (self RNA) and a non-specific (tRNA) competitors for both radiolabeled domain V RNAs (data not shown). Formation of RNA-proteins complexes was reduced by the addition of increasing amounts of unlabeled self RNA. This demonstrates the specificity of the cell protein interactions. In contrast, formation of complexes between cell proteins and yeast tRNA was minimal, as the addition of tRNA did not present significant competition effects. In order to assess cellular proteins binding to domain V of the CVB3 IRES, UV- crosslinking assays were performed. Domain V of the FMDV IRES was used as a control probe. 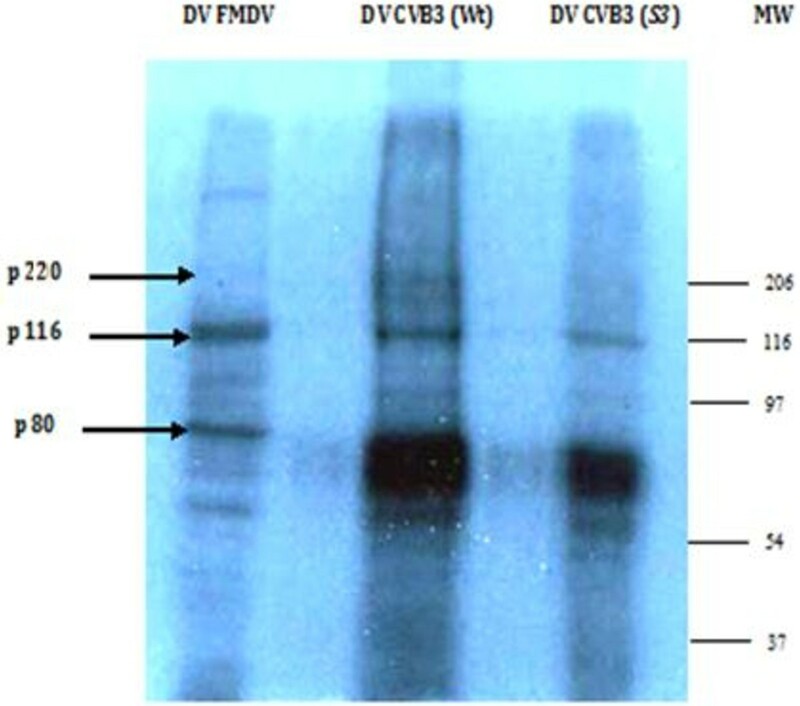 The comparative analysis of autoradiogram profiles (Figures 2 and3) shows that all labeled probes (CVB3 wild-type and mutant, and FMDV RNAs) bound to both cell extracts proteins. Interestingly, the mutant RNA showed a reduced protein binding profile compared to the wild-type domain V in both cell extracts. To confirm that the reduction of detection of RNA-protein complexes formed within the mutant CVB3 domain V RNA was due to the reduction in the protein binding efficiency to domain V and not to the loss of label transfer from the radioactive RNA to the protein, competitive assays were performed using unlabeled wild-type and Sabin3-like RNA competitors. RNAs competed efficiently with the binding of these proteins and to radiolabeled wild-type and mutant RNAs. Thus, the loss of detection of RNA-protein complexes observed with the mutant domain V was due to the loss of protein binding. Taken together, the above results indicate that the domain V contains a major determinant for protein-binding to the CVB3 IRES. In order to identify proteins that bind to the CVB3 IRES domain V, UV-crosslinking experiments were carried out. RNase A was then added to digest non-interacting regions of the labeled probes, and thus allows realistic molecular weight estimates. Domain V of FMDV IRES was used as a control probe in parallel to CVB3 RNAs. Figures 2 and3 show some proteins interacting with both FMDV and CVB3 RNAs. We detected a band migrating at an apparent molecular mass of about 116 kDa, which is supposed to be a component of eIF3. Another protein with an apparent molecular mass of about 80 kDa, as expected for eIF4B, was strongly labeled. These 116- and 80- kDa proteins previously identified, respectively, as eIF3 and eIF4B in FMDV[21, 49, 50] co-migrated with the same mobility for both IRES domain V RNAs suggesting that it could correspond to the same proteins. The identity of these proteins was then confirmed by immunoprecipitation. A third band migrating at an apparent molecular mass of about 220 kDa, as expected for eIF4G[22, 43] was also shown to bind, specifically, with CVB3 transcripts. Additionally, several other bands were labeled indicating the presence of other proteins binding to both viral IRES domains V. The smear-like patterns suggest the presence of multiple RNA–protein complexes over a range of molecular weights. Our previous observations that the Sabin3-like point mutation in domain V of the CVB3 IRES seriously affected ribosome association and protein-binding within the full IRES sequence, coupled with the fact that domain V is the major determinant for binding of some initiation factors led us to the conclusion that this single nucleotide exchange may directly affect the binding of these translation initiation factors and hence impair the association of the ribosome with the viral RNA. In order to confirm this hypothesis, UV cross-link assays were performed. In the presence of the Sabin3-like domain V RNA, the binding of p80 (eIF4B), p116 (eIF3) and p220 (eIF4G) was indeed impaired by this mutation compared to the wild-type RNA; thus correlating with the reduced translation efficiency of the Sabin3-like construct. In this experiment, the intensities of bands supposed to be identical to eIF4G, eIF4B and eIF3 were affected by the Sabin3-like mutation. Competition experiments confirmed that the observed reduction in band intensities was due to a reduced binding of these factors and not to a reduced label transfer only, while other bands were less strongly affected by the competitions. According to the data obtained by UV-crosslinking experiments, RNA-protein complexes obtained with both CVB3 domain V RNAs were differently susceptible to competitions. The differences in susceptibility to competition can be a consequence of the binding specificities of proteins. Specific interactions were concluded when band intensity corresponds to the decrease in competitor ratios. All proteins appeared to specifically interact with the domain V sequence as they were all susceptible to competitions. To confirm this specificity of RNA–protein interactions, filter-binding assays were carried out. We assayed whether the CVB3 domain V RNA could directly interact with individual initiation factors eIF3, eIF4B and eIF4G. Putative interactions were analyzed by filter-binding assays and the amount of resulting RNA–protein complexes was determined. Values obtained were extrapolated to draw graphs: % binding RNA–protein = f (protein concentration) (Figure 4). Filter-binding assays of some initiation factors binding to CVB3 wild-type (Wt) and Sabin3-like (S3) Domains V (DV) RNAs. Purified initiation factors eIF4G (a), eIF4B (b), and eIF3 (c) directly bind to the wild-type and the mutant Domain V RNAs. According to ANOVA statistical data, the percentage of RNA protein binding was significantly higher for the CVB3 wild-type RNA (p < 0.05) than the Sabin3-like RNA for all studied initiation factors; suggesting a better binding affinity of the initiation factors eIF3, eIF4G and eIF4B to the CVB3 wild-type domain V compared with the mutant RNA. Gene expression control largely depends on ribonucleoprotein complexes regulating mRNA translation. Initiation of translation in mRNAs that overcome cap-dependent translation inhibition is often driven by internal ribosome entry site (IRES) elements, whose activity is regulated by multifunctional RNA binding factors. Understanding the mechanism used by IRES elements to promote internal initiation of translation requires: (i) the identification of essential regions in the cis-acting elements (likely involved in the interaction with other regions of the RNA that composes the IRES as well as with cellular proteins), and (ii) the identification of translation initiation factors that bring the ribosome into contact with the mRNA. During the last decade, many efforts have been devoted to understand the mechanistic basis of IRES function and how these elements interact with host-cell components in order to recruit the translation machinery[21, 28, 43, 44, 49–54]. RNA structure plays a fundamental role in viral IRES dependent translation initiation. In support of this, mutations leading to the disruption of specific RNA structure motifs impaired IRES activity while the corresponding compensatory mutations restored IRES function[9, 55]. Furthermore, RNA structure of viral IRES elements is organized in modules which are phylogenetically conserved[56, 57], providing evidence in favor of a distribution of functions among the different RNA domains[58, 59]. In the best-known example, each of the three attenuated Sabin vaccine strains for poliovirus, considered the prototype picornavirus, contains nucleotide substitutions in domain V of the 5′UTR that are responsible for attenuation[60, 61]. These mutants have been shown to multiply poorly in neuronal cells, accounting for their decreased neurovirulence and inability to cause poliomyelitis. The attenuating mutations in the Sabin vaccine strains of PV have been identified, and it has been demonstrated that a key determinant of neurovirulence in each of the PV serotypes is located between residues 472 and 481, within domain V of the PV 5′UTR. It has been reported, in the case of poliovirus Sabin vaccine, that even single point mutation in the IRES may change the requirement of the virus ultimately affecting the viral RNA translation[37, 64]. Similarly, we have previously reported the limited efficiency of the translation of Sabin3-like mutant (U473 → C) of CVB3. Additionally, this Sabin3-like point mutation in domain V of the CVB3 IRES seriously affected ribosome association and protein-binding within the full IRES sequence. Thus, the consequence of this mutation was suggested to be a partial destabilization of the RNA secondary structure of the domain V, leading to reduced recognition of this region by protein factors necessary for translation initiation. Consequently, in the present study, in order to identify cellular proteins interacting within the CVB3 domain V, wild-type and mutant domain V transcripts were used in UV-crosslinking assays with S10 extracts prepared from BHK-21 or HeLa cells that support efficient IRES activity. We have observed a number of proteins binding to the CVB3 domain V RNA. Some of these binding proteins may be identical proteins that have multiple binding sites in the domain V; some of them may be different proteins with similar molecular weights. In fact, three major polypeptides of 220, 116 and 80 kDa, previously identified as eIF4G, eIF3 and eIF4B, respectively, were observed in both cell extracts. Although molecular weight determinations were not definitive in our UV-cross-linking assays, RNA-protein complexes that we have detected appear to be within reasonable range of these above-mentioned proteins, suggesting possible identities of those CVB3 domain V-binding proteins. To confirm the identity of these proteins, immunoprecipitation assays were carried out. Smear-like patterns represent multiple RNA-protein complexes which could not be distinguished as discrete bands. This suggests that multiple proteins interact with the same RNA molecule and that some of these proteins are in a relative higher content than other specific binding proteins. The RNA–protein interaction pattern could vary depending on the protein source used for the UV-cross-linking assay. This suggests two possible processes: the presence of multiple host proteins that bound the probes at differential affinities and quantities; or the co-operative binding of multiple copies of the same protein toward the probe. Filter-binding assays results showed a better affinity of binding of the initiation factors eIF3 (p116), eIF4G (p220) and eIF4B (p80) to the wild-type CVB3 IRES domain V compared with the mutant RNA. This finding clearly correlates with the data obtained by UV-cross-linking assays. Taken together, this can be explicated by the inability of the mutant domain V RNA to interact with some trans-acting factors critical for enhanced IRES function. Consequently, here we demonstrate that the reduction in the coxsackievirus B3 translation efficiency caused by the single nucleotide exchange in the IRES domain V sequence of the Sabin3-like strain is mediated by an impaired binding of the standard translation initiation factors eIF3, eIF4B and eIF4G to the mutant RNA. This in turn causes impaired association of ribosomes within the viral RNA as was previously reported. In conclusion, the CVB3 IRES domain V is the major determinant for the binding of standard initiation factors eIF3, eIF4G and eIF4B. Indeed, our present findings correlate with the data published by De Breyne and collaborators who reported that eIF4G specifically recognizes domain V of CVB3, EV71, and PV IRESs, binds to them with the same orientation, and, importantly, does so independently of other factors. These data extend the observation that eIF4G crosslinks to PV IRES domain V in RRL. eIF4G’s binding site is limited to the near-universally-conserved base of domain V. Mutations in this region severely impair translation and consequently impair or even abrogate virus growth. Since there are no more previous reports on protein-RNA interactions of the CVB3, we compare our findings to a close genomic related virus, the poliovirus. Our present results are in a perfect correlation with the previously published data of Ochs and collaborators[51, 65] who reported that eIF4B, eIF3, eIF4G, and PTB interact with the poliovirus IRES. They also demonstrated that the reduction in poliovirus translation efficiency caused by single nucleotide exchanges in the IRES of the three poliovirus Sabin vaccine strains is mediated by impaired binding of the standard translation initiation factor eIF4G to the poliovirus IRES domain V and that eIF4G is the crucial factor that initially binds to the poliovirus IRES and recruits the IRES to the other components of the translational apparatus, particularly to the p170 subunit of the ribosome-bound eIF3, thereby mediating association of the viral RNA with the small ribosomal subunit. These findings may have major implications for understanding the attenuation of poliovirus neurovirulence and the pathogenicity of other members of enteroviruses such as CVB3. Importantly, the introduction of the attenuating Sabin 3 mutation into domain V of the wild-type PV IRES at nucleotide 469 reduced cross-linking of eIF4G and eIF4B to this domain in RRL. These data and the fact that compensatory mutations that restored base-pairing in the base of PV domain V restored IRES-mediated translation and the IRES’s ability to interact with eIF4G strongly support the importance of this interaction for type I IRES function. eIF4G and eIF4A together induced strong toe prints at the 3′ border of type I IRESs (in domain VI and its immediate vicinity) that likely indicate conformational changes in the IRES, because no direct interaction of eIF4G or eIF4A with this region of the IRES was detected. The finding that recruitment of eIF4G/eIF4A to domain V led to these changes in domain VI is consistent with observations suggesting that domains V and VI are functionally linked and might interact structurally, such as their synergy in promoting UV crosslinking to the IRES of a 36-kDa protein in cellular extracts and determining PV neurovirulence. Interestingly, binding of eIF4G/eIF4A to the type II EMCV IRES induced analogous toeprints at its 3′ border. These conformational changes induced at the 3′ borders of type I and II IRESs could be essential for subsequent attachment of 43S complexes to these regions. Although these data strongly suggest that binding of eIF4G/eIF4A is a key step in initiation on type I and II IRESs, it is important to note that it is not sufficient for recruitment of 43S complexes on type II IRESs (and likely also not for type I IRESs). It was also shown that the binding site for eIF4B in the poliovirus IRES resides mainly in the IRES domain V, whereas domain VI sequences, including the silent AUG at nucleotide 586, contribute to the binding of eIF4B to a lesser extent, which is a finding consistent with the observation that domain VI is not absolutely essential for poliovirus translation[69, 70]. In domain V, several linker scanning mutations seriously impaired the binding of eIF4B. These mutations also seriously impaired poliovirus translation and growth, leading to either lethal or temperature-sensitive phenotypes. This correlation suggests that eIF4B may play an important role in the initiation of translation of the Poliovirus. In the relative position of its eIF4B binding site within the arrangement of secondary structures, the poliovirus IRES resembles type II IRES elements like those of FMDV and EMCV. In recombination experiments, the single point mutations in domain V were found to contribute to the attenuation of neurovirulence of the respective Sabin vaccine strains and experiments using chimeras of the poliovirus and rhinovirus IRES elements revealed that the IRES domains V and VI may contain determinants of neuropathogenicity. Probably due to the possible complexity of protein-RNA interactions involved in the activity of the poliovirus IRES, the initiation factor requirements have been investigated so far mainly with the distantly related picornavirus type II IRES elements. The IRES element of FMDV is organized in structural domains, termed 2–5 in 5′- to 3′-end, which appear to have a division of functions. Domains 2, 4 and 5 determine the interaction with RNA binding proteins and various translation initiation factors with the exception of eIF4E. Domains 4 and 5 are responsible for the recruitment of eIF4G, eIF4B, eIF3 and other IRES binding factors. Remarkably, domains 4 and 5 do not possess IRES activity by themselves, indicating that interaction with these factors is necessary but not sufficient for IRES function. eIF4B contains an RNA recognition motif (RRM) near the N-terminus and a second RNA-binding region in the carboxy-terminal half of the protein. Although the carboxy-terminal region binds RNA non specifically with high affinity, the RRM binds such RNAs inefficiently. RNA-binding specificity of the eIF4B RRM has been studied using in vitro selection with random sequences. The high affinity ligands showed a conserved set of nucleotides located in a structural motif consisting of a bulge stem-loop. It was reported that eIF3 bound to the FMDV IRES at multiple sites. A preferential eIF3 binding site resided in domain 5. However domain 4 also interacted with this factor and, although to a lower extent, they observed a crosslink of p116 to domains 1–2 and 3. The sequence of conserved residues in domains 4 and 5 is not an essential determinant for eIF3 interaction with FMDV IRES. It remains to be studied whether destabilization of the domain 5 structure impairs eIF3 binding to the FMDV IRES and concomitantly, affects IRES activity. Extending these results to the type I IRES of poliovirus, Ochs and collaborators showed that eIF4B binds strongly to the poliovirus IRES domain V. Consequently, it can be expected that the basic apparatus of initiation factors acting on the poliovirus IRES is the same as with the EMCV IRES and that eIF4G and eIF4B are directly and functionally involved in the process of translation initiation at the poliovirus and coxsackievirus B3 RNAs. Although there are similarities among IRES elements in terms of structures and ITAF requirements, there are also specific differences between IRESes even among those of the same classification. The lack of complete conservation of structural elements among viral IRESes and the differences among the viral IRESes in ITAF requirements have made stringent classification difficult. Attending to the essential requirements for internal initiation, IRES elements can be grouped in two main categories: (i) those that do not need proteins to assemble the initiation complex and (ii) those that do need factors to recruit the ribosome (typically, picornaviruses). Within the second category, distinct groups can be made depending on the RNA structural motifs and proteins required for activity. Indeed, picornavirus elements IRES belonging to types I and II require the C-terminal end of eIF4G, eIF4A, and eIF3 to assemble 48S initiation complexes[22, 49]. Type III IRES require intact eIF4G, and, in contrast, the HCV-like IRES does not need eIF4G to assemble 48S complexes. In addition to eIFs, auxiliary factors termed IRES transacting factors (ITAFs) contribute to modulate (either stimulate or repress) picornavirus IRES activity. In support of the relevance of factors different than eIFs for internal initiation, transcripts encompassing the region interacting with eIFs do not possess IRES activity, indicating that interaction with eIFs is necessary but not sufficient for IRES function. In summary, the study presented here is an attempt toward the identification of standard initiation factors binding to the domain V of CVB3 IRES and involved in the internal translation initiation of the CVB3 genomic RNA. Interestingly, our present findings implicate that the main effect of the Sabin3-like mutation that contributes to (i) the attenuation of the cardiovirulence, (ii) the reduction efficiency of translation, (iii) the impaired ribosomal initiation complex 48S and 80S assembly and (iv) the reduction of RNA-protein binding pattern within the full IRES sequence is the impaired binding of the translation initiation factors eIF3, eIF4G and eIF4B to the IRES domain V mutant RNA. Indeed, the Sabin3-like mutation could induce a partial destabilization of the secondary structure of domain V, leading to reduced recognition of this region by protein factors necessary for CVB3 translation initiation. This may cause slower translation of the viral RNA and thus may contribute to the attenuated phenotype of the Sabin3-like strain. Nevertheless, the possible involvement of other trans-acting factors (ITAFs) is not ruled out. It can only be speculated if these ITAFs additionally modulate the CVB3 IRES activity, if their binding to Sabin3-like mutant is reduced, and if their possibly reduced binding contributes to the attenuated phenotype of the Sabin3-like strain. Hence, mapping the exact binding sites of eIF3, eIF4G and eIF4B to domain V of the CVB3 IRES and the identification of other proteins involved in the enhancement of CVB3 IRES-mediated translation would be clearly a challenge in the near future to confirm our results and to increase our understanding of the translation initiation, the 5′UTR-related tissue tropism and the cardiovirulence mechanisms. Translation initiation mechanisms affecting the efficiency of protein synthesis of a given mRNA are diverse and, importantly, more frequent than anticipated, sometimes giving rise to the expression of different polypeptides from a single transcriptional unit. Therefore, presence of any of these regulatory elements can seriously complicate efforts to accurately define the sites of translation initiation at the genome wide scale. We gratefully acknowledge Professor Encarnación Martínez-Salas; Centro de Biología Molecular “Severo Ochoa”, Consejo Superior de Investigaciones Científicas, Universidad Autónoma de Madrid (Spain) for the scientific assistance. JG and MBMG: participated in the design of the study. AS carried out the experiments and wrote the manuscript. All authors red and approved the final manuscript.